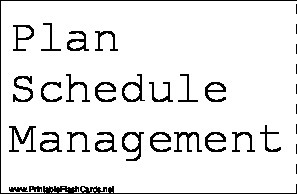 Plan Schedule Management Process of establishing the policies, procedures, and documentation for planning, developing, managing, executing, and controlling the project schedule. Define Activities Process of identifying and documenting the specific actions to be performed to produce the project deliverables. Templates A partially complete document in a predefined format that provides a defined structure for collecting, organizing, and presenting information and data. 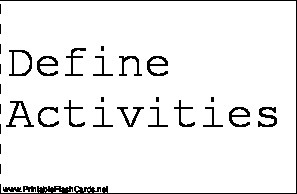 Activity List A documented tabulation of schedule activities that shows the activity description, activity identifier, and a sufficiently detailed scope of work description so project team members understand what work is to be performed. Sequence Activities Process of identifying and documenting relationships among the project activities. Sequencing can be performed by using project management software or by using manual or automated techniques. Mandatory Dependencies (or Hard Logic) Dependencies that are contractually required or those inherent in the nature of the work. Often involve physical limitations. External Dependencies A relationship between project activities and non-project activities These dependencies are outside the project team`s control. Sub Network / Fragment Network A subdivision (fragment) of a project schedule network diagram, usually representing a subproject or a work package. Often used to illustrate or study some potential or proposed schedule condition, such as changes in preferential schedule logic or project scope. Project Schedule Network Diagram A graphical representation of the logical relationships among the project schedule activities. Estimate Activity Resources Process of estimating the type and quantities of material, human resources, equipment, or supplies required to perform each activity. Analogous Estimating (top-down) A technique for estimating the duration or cost of an activity or a project using historical data from a similar activity or project. Contingency An event or occurrence that could affect the execution of the project that may be accounted for with a reserve. Buffer, Reserve A provision in the project management plan to mitigate cost and/or schedule risk. Often used with a modifier to provide further detail on what types of risk are meant to be mitigated. Estimate Activity Durations The process of estimating the number of work periods needed to complete individual activities with estimated resources. Develop Schedule The process of analyzing activity sequences, durations, resource requirements, and schedule constrains to create the project schedule model. Resource Calendar A calendar that identifies the working days and shifts on which each specific resource is available. Lead The amount of time whereby a successor activity can be advanced with respect to a predecessor activity. Lag The amount of time whereby a successor activity is required to be delayed with respect to a predecessor activity. Mathematical Analysis This involves calculating the theoretical early and late start and finish dates for all project activities without regard to any resource pool restrictions. Critical Path Method A method used to estimate the minimum project duration and determine the amount of scheduling flexibility on the logical network paths within the schedule model. Program Evaluation and Review Technique (PERT) A technique for estimating that applies a weighted average of optimistic, pessimistic, and most likely estimates when there is uncertainty with the individual activity estimates. Schedule Compression Techniques used to shorten the schedule duration without reducing the project scope. Crashing A technique used to shorten the schedule duration for the least incremental cost by adding resources. It will only work for those activities on the critical path where additional resources will reduce the activity`s duration. Crashing does not always produce a viable alternative. It could increase either risk or cost, or both risk and cost of the project. Fast Tracking A schedule compression technique in which activities or phases normally done in sequence are performed in parallel. for at least a portion of their duration. Fast tracking often results in rework and increased risk. It works only if activities overlap. Simulation Uses a project model that translates the uncertainties specified at a detailed level into their potential impact on objectives that are expressed at the level of the total project. Project simulations use computer models and estimates of risk and are typically performed using Monte Carlo analysis. Resource Leveling A technique in which start and finish dates are adjusted based on resource constraints with the goal of balancing demand for resources with the available supply. Resource Smoothing A technique which adjusts the activities of a schedule model such that the requirement for resources on the project do not exceed certain predefined resource limits. 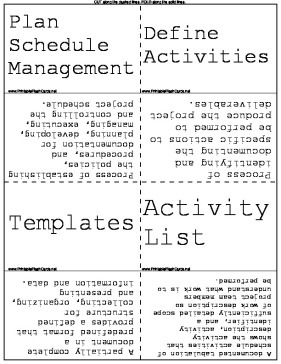 Coding Structure Activities should have a coding structure to allow sorting and/or extractions based on different attributes assigned to the activities. Project Schedule An output of a schedule model that presents linked activities with planned dates, durations, milestones, and resources. Schedule Baseline The approved version of a schedule model that can be changed only through formal change control procedures and is used as a basis for comparison to actual results. Schedule updates Approved modifications to the project schedule that are used to manage the project. Schedule management plan A component of the project management plan that establishes the criteria and the activities for developing, monitoring, and controlling the schedule. Control Schedule The process of monitoring the status of project activities to update project progress and manage changes to the schedule baseline to achieve the plan. Root Cause Analysis An analytical technique used to determine the basic underlying reason that causes a variance or a defect or a risk. A root cause may underlie more than one variance or defect or risk. Root cause analysis is done as part of corrective action. Helps identify the cause of variation, so that schedule recovery can be planned and executed for the activities defined later in the schedule. Total Float The amount of time that a schedule activity can be delayed or extended from its early start date without delaying the project finish date or violating a schedule constraint. Free Float The amount of time that a schedule activity can be delayed without delaying the early start date of any successor or violating a schedule constraint.